Aromatic Eastern flavours bring a refreshingly contemporary edge to a traditional prawn cocktail. To make the dressing, place the coconut milk in a medium saucepan with half the chilli, and all the ginger and lemon grass. Bring to the boil, then reduce the heat and simmer gently for 5 minutes. Leave to cool for about 30 minutes to allow the flavours to infuse. Strain the dressing through a sieve into a bowl. Stir in the yoghurt, mint, lime zest and juice, and the remaining chilli, season lightly and then stir in the prawns. 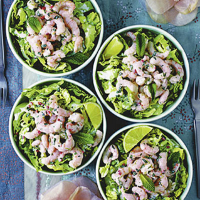 Divide the Romaine lettuce between 4 small serving dishes and spoon the prawns and dressing over the top. Serve immediately, garnished with the reserved mint sprigs and a slice of lime, or a little more red chilli, finely sliced. Prepare the coconut infusion the day before, cover and leave in the fridge until ready to use - this will allow the flavours to really develop. The prawn cocktails can be assembled up to 1 hour before serving, if kept chilled.